One of the unique joys of pastoral ministry is the opportunity to preach on Sabbath mornings. It’s always exciting to discover how God will use humble thoughts and faithful study to instruct and inspire a few hundred people at one time. I regularly find myself in awe of the process, and I really enjoy participating in it. I look forward to the opportunities to preach and you’d be hard-pressed to find me willingly giving up that opportunity for any reason However, that’s just what will happen tomorrow at Sunnyside, and I believe we’ll all be better off for it. It was a few months ago that Lydia Krueger-Blehm came to me with an idea. “I want to preach,” she said. As we began to talk about her journey and the message that God was laying on her heart, I quickly knew that it was the right thing. Over the past few months, we’ve spent countless hours together studying, thinking, and working together to make sure her thoughts and inspiration would shine through. And tomorrow is the day that it will all come together. Over those months, I’ve come to appreciate her perspective, her thinking, and her focus. And for, possibly, the first time in my life I’m really excited that I’m not the one preaching tomorrow, because I believe God has given Lydia a message. I’m looking forward to hearing it from the front row. I hope that you’ll be there. I hope you’ll be there to support one young lady as she faces the fear of sharing her ideas with the world. I hope you’ll be there to give her encouragement and attention. But most of all I hope you’ll be there to be inspired, to hear a word from our great God. Sabbath worship services are at 8:45 and 11:15 am. Lydia Krueger-Blehm will be presenting our Bible message entitled Worship. 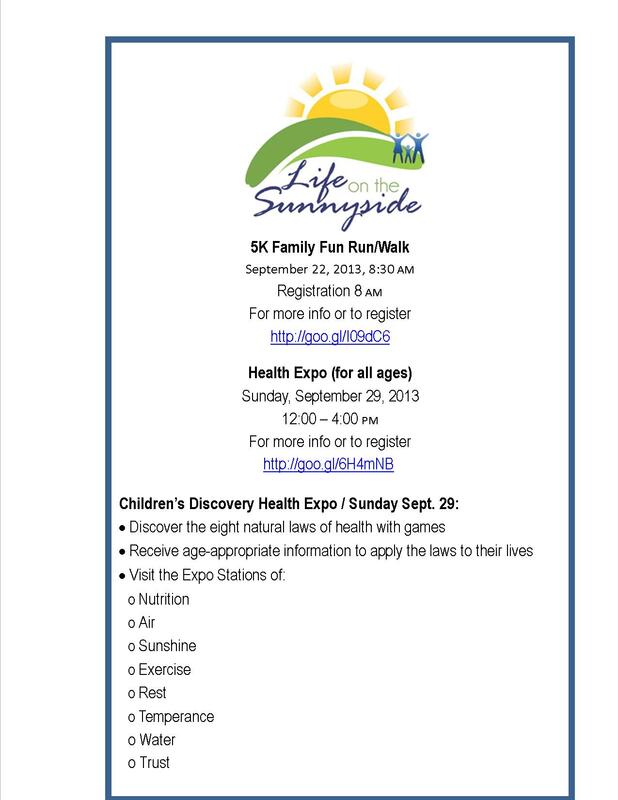 Children’s Health Expo is coming September 29. We are preparing some giveaway bags and would like to include small bars of soap. If you can donate some, please drop them off at the church office. Adult Health Expo is also September 29. If you would like to volunteer to help, please contact the church office at 503-252-8080. Adventist Health Hospice is offering free training for new volunteers October 7-9 and Oct 14-16 from 6-8 pm. This is a wonderful opportunity to train for a rewarding ministry, touching lives and families. For more information email, Debra Schneider, volunteer coordinator, at Debra.Schneider@ah.org or contact Harold Burden at 503-257-4883 or hoburden@earthlink.net. The Pathfinders are selling pies to raise funds for the International Camporee in Oshkosh next year. Help them out by ordering your holiday pies in advance. Orders need to be placed by October 15 and they will be available for pick up on November 4. There is a flyer available on the Information table. The Pathfinders are also involved in a glass-etching honor. They are in need of donations of plain glass vases, bowls, mirrors, drinking glasses, etc. If you can donate any of these, please drop them by the church office. Family Resource Network – So far this year, because of your gifts, we were able to help many members of our church family and community that had pressing financial needs. We appreciate you remembering your brothers and sisters. When contributing, just mark your contribution to account #9387, Family Resource Network. Thank you. Gerald Bruce, Alex Buchanan, Michael Hamilton, Jim Kramer (Tom Kramer’s brother), Ted Morford, Nancy Ruhl, and all who have financial, spiritual, and health needs. This week, the floral tribute is presented by Calvin and Shirley Hartnell in celebration of Cal’s 90th birthday. This event is now full, but for satellite viewing contact Renee Geppert at Lents Church, 503-774-7290.